Space is one of the hottest commodities there is when it comes to any type of property. In today’s world, it isn’t even just about the space, but what you do with it. More people are learning about smart ways to make the most of what space they have. With major cities continuing to grow, and the actual living spaces getting smaller, now is a great time to learn how to save space with features like a sliding door rail system. What is a Sliding Door Rail System? A sliding door rail system is exactly what it sounds like. Rather than pulling a door open toward the inside of the room or swinging it closed, these doors slide open and closed. This means you don’t need that extra space that is required to give the door room to serve its function. Obviously a closed door doesn’t take up any extra space, but, with swinging doors, you have to leave room not just for the act of opening and closing a door, but for the act of leaving one open against a wall. The sliding system relies on a rail that hangs above the door. The doors are suspended from the rail with rollers. Rather than pulling or pushing them, you simply slide the door one way or the other. Even when the door is open, it only takes up the space from the left or the right. There are some benefits of sliding rail doors which simply don’t exist with hinged doors. With sliding doors being so compact, you can take advantage of the unique design functionality. For instance, powder rooms and small bathrooms with limited interior space are perfect for a sliding rail door mounted on the exterior side. Every bit of space can then be used in the bathroom interior to best advantage. The hip trend in tiny homes is popular with newly married couples, singles looking for a first time affordable home and baby boomers scaling down in retirement. Sliding door rail systems are extremely useful for their space-saving nature in tiny homes with doors as narrow as 28″ bathrooms, storage areas or pantries. 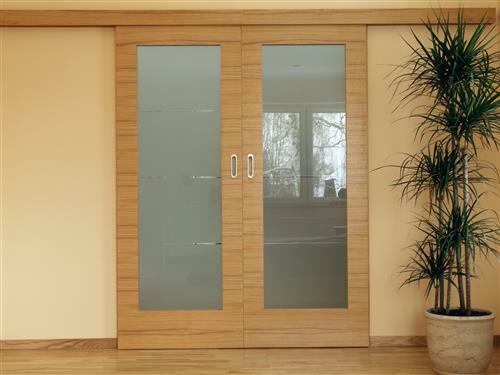 Another super trendy use of sliding doors versus swing doors is for screening. Monster-sized man cave monitors can be hidden from view behind rustic rolling doors when not in use. 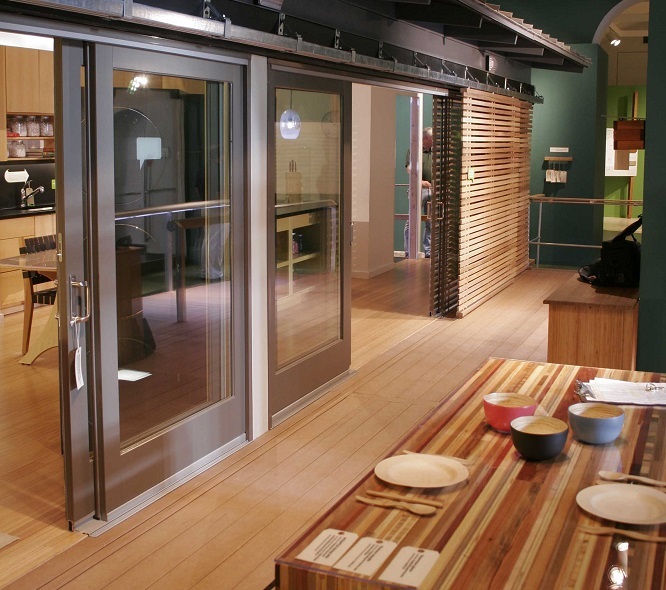 Savvy kitchen designers are specifying rolling barn doors on rails to screen a pantry or work prep area. How much more interesting is it than storing pantry good behind a hinged door? Look at many renovated factory lofts in urban areas and you will see another preference for sliding doors rather than swing doors. Parallel sliding doors with box track and hangers can be ceiling mounted to divide space within a large, tall room, partitioning the area into two spaces for multi-purpose uses such as for privacy when having guests visit. Using the sliding door rail system opens up a lot of opportunity to use space as you see fit instead of using it as your doors dictate. On top of all of the functionality possibilities, property owners will also appreciate the improved décor. You can buy doors that offer an industrial look or doors that offer a more rustic look. Either way, you can personalize them to fit your needs.